There’s a lot of competition on LinkedIn, so if you’re looking for a job you need a few tricks to stand out. In this article I’m going to show you a little-known technique you can use to make your profile immediately catch attention from recruiters (and anyone else who reads it). Note: This is what I’d call an “advanced” tip. Not because it’s difficult but because it’s designed to put your profile over the top after it’s already pretty good. Also, this tip is specifically for standing out AFTER someone clicks your profile. If you want help getting more profile views, or if you haven’t updated your profile in a while and you just need some general advice, check out this LinkedIn tips article first. It’ll help you a ton. Each section of your LinkedIn profile can be dragged higher or lower. You can change the order, but most people don’t. How will this help you stand out? Recruiters spend a LOT of time on LinkedIn. Looking through hundreds of profiles. And we usually see the same things each day over and over. Like anyone, we get tired, and start to go into “autopilot”. Our brain is half awake as we scan through a bunch of profiles quickly, looking for one or two keywords. When you reorder your profile, it’s what’s called a “pattern interrupt” (in the world of advertising). It shocks us back into being fully awake. It literally GRABS our attention. A pattern interrupt is basically just something you didn’t expect to see in the place you were looking. If you put your skills before anything else, or if you put linkedin recommendations before your recent work history, it’s going to look WAY different than what we’ve been seeing all day. We are going to stop and take a very close look, I guarantee it. Put your skills at the top if you’re in a technical role like engineering, science, etc. Use your best judgement here. This is really going to depend on your situation. The idea here isn’t to “hide” your summary and work history. They’re important and recruiters will want to see your work history for sure. But putting ONE hand-picked section before your work history will grab attention and wake the reader up so you have their full attention. Maybe. I don’t personally think so. If you do this you will get far more people stopping and reading your profile. It’ll also show hiring managers and recruiters that you’ve thought about your profile and didn’t just stick with the exact layout LinkedIn gave you. It shows them you worked on your profile and that you care about your job search. The point of this article is to let you know that this tool is available and that almost nobody is using it. 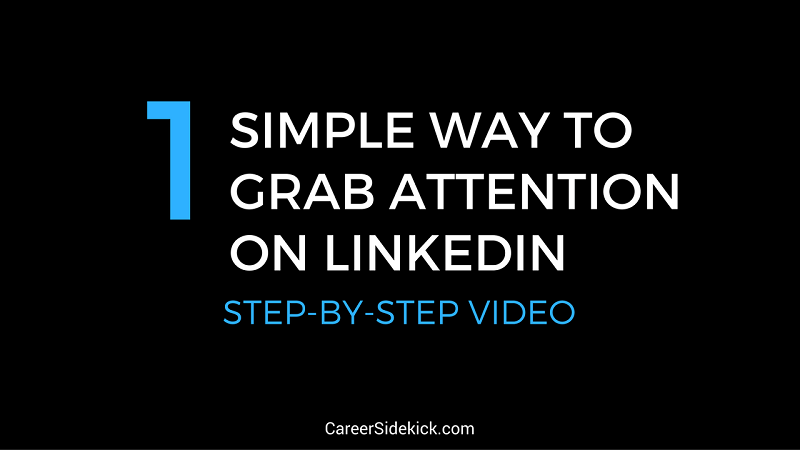 It’s another way to gain an advantage on LinkedIn. You’re not obligated to use it though. Don’t force it if there isn’t a good way to use this in your current situation! Don’t “bury” your work history if you think it’s the most impressive piece of your background. Just keep this trick in mind, think about whether it makes sense to use. That’s what I recommend.